If you’re building a modern application, chances are you’ll need to store data in some persistent state. Over the last few years, we’ve been building features to help – providing Droplets with generous SSD storage and adding Block Storage as another flexible option for you to maintain stateful applications. These features have enabled you to build your entire application stack, including your own databases, on our platform. However, you’re probably aware that building and maintaining your own database cluster can be cumbersome and can take away time from solving your business problems or application logic. That’s why our community has been asking for more automation and management of databases in order to focus on what's important: writing code. 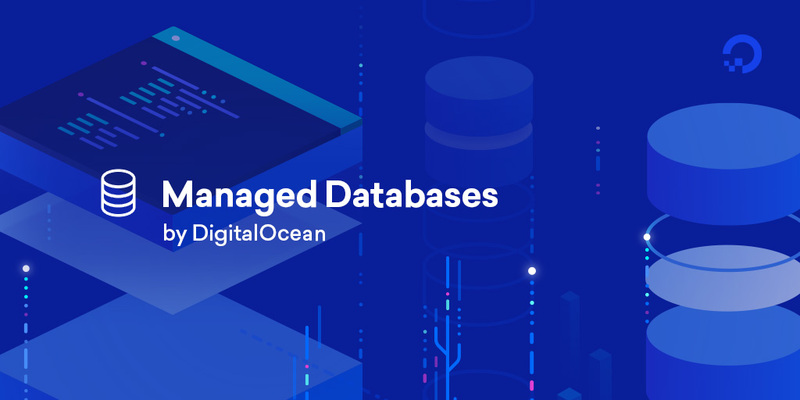 Well, today we are excited to bring you Managed Databases by DigitalOcean, our own fully managed and feature rich database service. Starting with support for PostgreSQL, Managed Databases enables developers of all skill levels to quickly and easily spin up a high-performance database cluster that is worry-free and scalable. Best of all, you don’t need to know anything about the Linux operating system or specific DevOps maintenance tasks. Managed Databases provides a stable endpoint that developers can throw data into and request data from, so you don’t have to think about the intricacies of database administration. We’re leading with PostgreSQL 10 and 11, which has more than 30 years of active community development. This makes it the most advanced SQL-compliant object-relational database on the market. Since it’s built on top of our core compute platform and uses local SSD storage, it’s lightning fast. In addition to our simple database dashboard, you can manage your database clusters programmatically with the DigitalOcean API. You can configure your database to be accessed from anywhere in the world, but, as you probably guessed, you will get higher performance if your data is near your application server. Therefore, we’ve enabled the service in all of our available regions, although some data center exceptions do exist. You’ll enjoy simple, predictable pricing that allows you to control your costs. Spin up a database node starting from $15 per month or high availability cluster from $50 per month. Backups are included for free with your service to keep things simple. Ingress bandwidth is always free, and egress fees ($0.01/GB per month) will be waived for 2019. Check out a demo of Managed Databases in action! A significant advantage to Managed Databases is saving time – lots of time. Quickly deploy a database, and we’ll handle the rest. Never worry again about security patches to the OS or database engine – once a new version or patch is available, simply click a button to enable it. All data is encrypted at rest and in transit. Use the Cloud Firewall to restrict connections to your database. Your database runs on enterprise-class VM hardware with local SSD storage, giving you lightning-fast performance. The “right size” for your infrastructure is a moving target. With Managed Databases, you can scale up at anytime with virtually no impact to your application. You have flexibility, so you can spin up read-only nodes to scale read operations or remove compute overhead from reporting requirements. Sleep easy, knowing that if an issue occurs with your primary node, traffic will automatically get routed to your standby nodes. We recommend selecting a high-availability option to minimize the impact in case of a failure. Backups are handled automatically and included to you at no additional fee. Full backups are taken everyday and write-ahead-logs are maintained to allow you to restore to any point-in-time during the retention period. We hope you are as excited as we are about this release! Our engineering team is working hard to bring you even more functionality for your databases in 2019. We plan to have additional engines such as Redis and MySQL, private networking with enhanced VPC, metrics, and alerting through Insights. If you are planning to attend Postgres Conference in New York City March 18–22, be sure to stop by and chat with me and the other members of the Product team. We’d love to meet you. Ready to create a database? Try Managed Databases now.